Dr Kate Gartlan is an immunologist with considerable expertise in cellular immunology, particularly using in vivo models of inflammation to investigate immune-modulation and T cell polarisation. 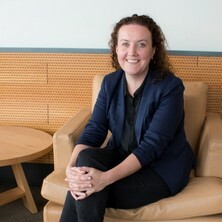 Dr Gartlan began her research career at WEHI within Professor Ken Shortman’s laboratory developing strong skills in both molecular and cell biology, where she became interested in the early factors that influence adaptive immunity. She completed her PhD in 2009 at the Burnet Institute working with Associate Professor Mark Wright, where she studied functional redundancy between Tetraspanin proteins in the immune system. To advance her understanding of inflammatory mediators and adaptive immune polarisation, she moved to the University of Oxford and took up a postdoctoral position within the Sir William Dunn School of Pathology. Working with Professor Quentin Sattentau, she investigated novel ways to modulate T cell polarisation and influence B cell responses to HIV vaccines. After returning to Australia, she has worked with Professor Geoff Hill at QIMR Berghofer investigating novel therapies to treat graft-versus-host disease (GVHD) in allograft recipients. Dr Gartlan has held active teaching roles within both university and research institute environments, contributing to undergraduate science and medicine programs at both departmental and college levels. Her main research interests at present surround the role of IL-17 & IL-22 in GVHD, potential therapeutics to modulate T cell polarisation after allogeneic bone marrow/stem cell transplant (BMT/SCT), as well as developing novel inhibitors of graft rejection to improve engraftment after BMT/SCT. What is the influence of infection driven T cell polarisation on graft-versus-host disease? Background: Stem cell/bone marrow transplantation (SCT/BMT) is an important curative therapy for haematological malignancies and disorders; however graft-versus-host disease (GVHD) and infection are two major complications of this procedure. Whilst it is well established that viral and bacterial infections influence GVHD pathogenesis, the impact of fungal infection after transplant is poorly understood. In non-transplant settings, adaptive immune responses to fungal infections are commonly associated with IL-17 production by T cells that enhance anti-fungal immunity. However our laboratory and others have demonstrated that the IL-17 differentiation pathway is pathogenic in the context of allotransplantation. We are offering a project designed to understand the relationship between fungal infection and GVHD outcomes. Aims: This project aims to 1) establish an in vivo infection model that can be used in conjunction with bone marrow transplant in pre-clinical experimental systems. 2) Explore the relationship between fungal infection, T cell polarisation and GVHD. Significance: Once established, this model will be the first of its kind and will be an important tool to examine the influence of infection on inflammatory diseases. Suitability: This project would suit a PhD student. Background: Stem cell transplantation (SCT) is an effective cancer treatment, however its application is limited by graft-versus-host disease (GVHD), which has a major impact on patient morbidity and mortality. Unfortunately, GVHD severity and tumour clearance are positively correlated and therefore new therapies designed to reduce GVHD must be targeted, such that anti-tumour immunity is maintained. Donor T cell polarization is a critical factor influencing the severity and tissue distribution of graft-versus-host disease (GVHD) and the potency of graft-versus-leukaemia (GVL) effects after allo-SCT. We have identified a pathogenic donor T cell differentiation program that exacerbates GVHD without contributing to tumour clearance, which is characterised by a unique transcription factor expression profile. Aims: This study will 1) examine T cell transcription factor expression after allo-SCT in both murine and clinical samples, and 2) utilise a small molecule inhibitor that modulates transcription factor expression to assess its therapeutic potential in the context of GVHD. Significance: This therapeutic approach is highly novel and will provide the first essential proof-of-concept data to support small molecule modulation of T cell polarisation as a method for GVHD prevention and treatment. Suitability: This project would suit either Honours or PhD students. Background: Micro RNAs (miRNAs) are small RNA molecules (~25 nucleotides) known to play an important role in regulating inflammation. Therefore miRNA may be a novel target to treat inflammatory diseases such as graft-versus-host disease (GVHD). GVHD develops in >50% of leukaemia patients that receive a donor stem cell/bone marrow transplant (SCT/BMT). GVHD has a major impact on the mortality and quality-of-life for these cancer survivors, however treatment options are very limited and steroid refractory GVHD patients (~20%) have particularly high mortality rates. Unfortunately, GVHD severity and tumour clearance are positively correlated, which means a balance must be struck between providing anti-tumour immunity and reducing the risks associated with GVHD. Our laboratory is therefore investigating novel therapeutics such as miRNAs to modulate inflammatory responses after BMT/SCT. Aims: We are currently offering a project designed to 1) characterise miRNA expression profiles in patient serum after BMT/SCT and 2) to evaluate potential inflammatory biomarkers of GVHD. Significance: New therapies are urgently needed to minimise the effects of GVHD after donor SCT/BMT. This project will use molecular and cell biology techniques and clinical samples to identify potential new targets for GVHD immunotherapy.